These results are meant to give you a basic idea on the frame size you need. or drop us a message via the contact form or directly via e-mail. What do I need my inseam length for? Besides your body height your inseam is the most important factor in finding the correct frame size. How do I measure my inseam length? 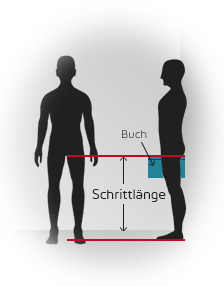 To determine the measurements of your inseam, we recommend to get the help of another person. Take your shoes off. Measurements are best taken barefoot or in socks. Stand up against a wall, wearing undergarments or cycling pants. Use a book or a level and place it between your legs, as far up as possible. A book is the better choice as you can easily place it orthogonal to the wall. Measure the distance from top edge of level/book to the floor. The result is your inseam length. Using our frame size calculator and your inseam length you can determine the frame size best suited for you.